Joe Romm wrote a post in early November claiming UNFCCC Executive Secretary Christiana Figueres had misled the public in claiming that the “INDCs have the capability of limiting the forecast temperature rise to around 2.7 degrees Celsius by 2100”. Using Climate Interactive’s figures Romm claims the correct figure is 3.5°C. That Romm had one of two sources of the 2.7°C staring at him is a side issue. The major question is how Climate Interactive can achieve a full 1.0°C reduction in expected temperature rise in 2100 and a reduction of 40% in 2100 GHG emissions from pledges covering the period 2015, when the UNFCCC estimates will have a much smaller impact in 2030? Looking at the CO2 emissions, which account for 75-80% of GHG emissions, I have found the majority answer. For OECD countries where emissions per capita have been stable or falling for decades, the “No Action” scenario forecasts that they will rise for decades. For Russia and China, where per capita emissions are likely to peak before 2030 without any policy action, the “No Action” scenario forecasts that they will rise for decades. This is largely offset by Climate Interactive assuming that both emissions and economic growth in India and Africa (where there are no real attempts to control emissions) will stagnate in the coming decades. Just by making more reasonable CO2 emissions forecasts for the OECD, Russia and China can account for half of the claimed 2100 reduction in GHG emissions from the INDC. Climate Interactive’s “No Action” scenario is bogus. If countries go no further than their current global climate pledges, the earth will warm a total of 3.5°C by 2100. At a basic level Romm should have done some proper research. As I found out, there are two sources of the claim that are tucked away at the end of a technical appendix to the UNFCCC Synthesis report on the aggregate effect of INDCs. One of these is Climate Action Tracker. On their home page they have a little thermometer which shows the 2.7°C figure. Romm would have seen this, as he refers in the text to CAT’s page on China. The significance may not have registered. Figure 2. 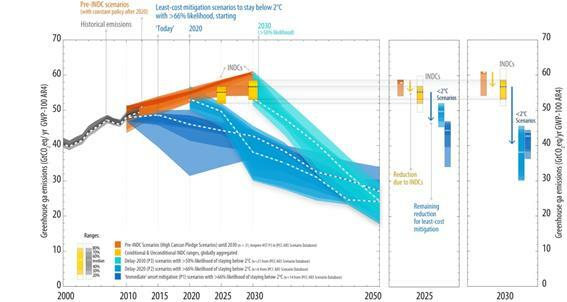 UNFCCC’s estimate of emissions impact of the INDCs, with the impact shown by the yellow bars. Original here. There are two things that do not stack up. First is that the “No Action” scenario appears to be a fairly reasonable extrapolation of future emissions without policy. Second, and contrary to that is the first, is that the “Current INDCs” scenario does not make sense in terms of what I have read in the INDCs and is confirmed by the INDCs. To resolve this requires looking at the makeup of the “No Action” scenario. Climate Interactive usefully provide the model for others to do their own estimates,2 With the “User Reference Scenario” giving the “no action” data3, split by type of greenhouse gas and into twenty regions or countries. As about 75-80% of emissions with the model are CO2 Fossil Fuel emissions, I will just look at this area. For simplicity I have also reduced the twenty regions or countries into just seven. That is USA, Other OECD, Russia, China, India, Africa and Rest of the World. There are also lots of ways to look at the data, but some give better understanding of the data than others. Climate Interactive also have population estimates. Population changes over a long period can themselves result in changed emissions, so looking at emissions per capita gives a better sense of the reasonableness of the forecast. I have graphed the areas in figure 3 for the historical period 1970-2010 and the forecast period 2020-2100. Figure 3 : Fossil Fuel Emissions per capita for six regions from the Climate Interactive “No Action” Scenario. In the USA, emissions per capita peaked at the time of 1973 oil embargo. Since then they have declined slightly. There are a number of reasons for this. First, higher oil prices gave the economic incentives to be more efficient in usage of oil. In cars there have been massive improvements in fuel efficiency since that time. Industry has also used energy more efficiently. Second, there has been a growth in the use of nuclear power for strategic reasons more than economic. Third is that some of the most energy intensive industries have shifted to other countries, particularly steel and chemicals. Fourth, is that growth in developed countries is mostly in the service sector, whereas growth in developing countries is mostly in manufacturing. Manufacturing tends to have much higher energy usage per unit of output than services. Fifth, is that domestic energy usage is from cars and power for the home. In an emerging economy energy usage will rise rapidly as a larger proportion of the population acquire cars and full heating and lighting systems in the home. Growth is much slower once most households have these luxuries. Sixth is that in the near future emissions might continue to fall with the development of shale gas, with its lower emissions per unit of power than from coal. I therefore cannot understand why anyone would forecast increasing emissions per capita in the near future, when they have been stable or falling in for decades. Will everyone start to switch to less efficient cars? When these forecasts were made oil was at $100 a barrel levels, and many thought peak oil was upon us. Would private sector companies abandon more efficient energy usage for less efficient and higher cost usage? The USA may abandon nuclear power and shift back to coal for political reasons. But in all forms of energy, production and distribution is likely to continue to become more efficient in all forms. In the rest of the OECD, there are similar patterns. In Europe energy usage was never as high. In some countries without policy CO2 emissions may rise slightly. In Germany they are replacing nuclear power stations with coal for instance. But market incentives will increase energy efficiency and manufacturing will continue to shift to emerging nations. Again, there appears no reason for a steady increase in emissions per capita to increase in the future. China has recently had phenomenal growth rates. According to UN data, from 1990 to 2012, economic growth averaged 10.3% per annum and CO2 emissions 6.1%. In the not too distant future economic growth will slow as per capita income approaches rich country levels, and emissions growth will slow or peak. But the Climate Interactive forecast has total emissions only peaking in 2090. The reason for China’s and Russia’s forecast per capita emissions exceeding those of the USA is likely due to a failure to allow for population changes. In USA population is forecast to grow, whilst in China and Russia population is forecast to fall. For the continent of Africa, there have been encouraging growth signs in the last few years, after decades when many countries saw stagnation or even shrinking economies. Climate Interative forecasts similar growth to India, but with a forecasts of rapid population growth, the emissions per capita will hardly move. The first three columns in pale lilac are for CO2 emissions per capita calculated, from the Climate Interactive data. In the 2100 Revised column are more realistic estimates for reasons discussed in the text. 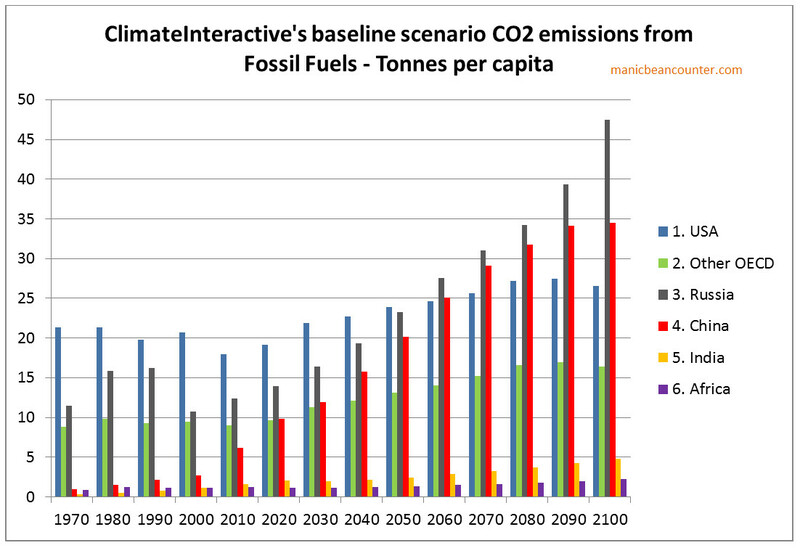 In the orange part of the table are the total forecast 2100 Climate Interactive figures for population and CO2 emissions from fossil fuels. In darker orange is the revised emissions forecast (emissions per capita multiplied by forecast population) and the impact of the revision. Overall the forecast is 10.2GtCO2e lower, as no calculation has been made for the rest of the world. To balance back requires emissions of 11.89 tonnes per capita for 2.9 billion people. As ROW includes such countries as Indonesia, Bangladesh, Iran, Vietnam, Brazil and Argentina this figure might be unreasonable 85 years from now. The INDC submissions can be broken down. Overall for these areas the overestimation is around 31 GtCO2e. Instead of 63.5GtCO2e forecast for these countries for 2100 it should be nearer 32.5GtCO2e. This is about half the total 2100 reduction that Climate Interactive claims that the INDC submission will make from all types of greenhouse gases. A more rigorous forecast may have lower per capita emissions in the OECD and China. There may be other countries where similar forecast issues of CO2 emissions might apply. In addition, in note 7 I briefly look at the “No Action” CH4 emissions, the second largest greenhouse gas. There appear to be similar forecast issued there. In summary, the make-up of the CO2 emissions “No Action” forecast is bogus. It deviates from an objective and professional forecast in a way that grossly exaggerates the impact of any actions to control GHG emissions, or even pledges that constitute nothing more than saying what would happen anyway. The conversion of a given quantity of emissions into average surface temperature changes is outside the scope of this article. Also we will assume that all policy pledges will be fully implemented. On the Home page use the menu for Tools/C-ROADS. Then on the right hand side select “Download C-ROADS”. Install the software. Run the software. Click on “Create New Run” in the centre of the screen. This will generate a spreadsheet “User Scenario v3 026.xls”. The figures I use are in the User Reference Scenario tab. The software version I am working from is v4.026v.071. The “User Reference Scenario” is claimed to be RCP 8.5. I may post at another time on my reconciliation between the original and the Climate Interactive versions. The forecast estimates for economic growth and emissions for Russia look quite bizarre when the 5 year percentage changes are graphed. I cannot see any reason for growth rates to fall to 1% p.a in the long term. But this is the situation with most others areas as well. Nor can I think of a reason for emissions growth rates to increase from 2030 to 2055, or after 2075 expect as a contrivance for consistency purposes. The forecast estimates for economic growth and emissions for India look even more bizarre than for Russia when the 5 year percentage changes are graphed. I am writing on 30/12/15. To meet the growth forecast for 2010-2015, India’s GDP will need to drop by 20% in the next 24 hours. From 2015 to 2030, the period of the INDC submissions, CO2 emissions are forecast to grow by 8.4%. India’s INDC submission implies GHG emissions growth from 2014 to 2030 of 90% to 100%. Beyond that India is forecast to stagnate to EU growth rates, despite being a lower to middle income country. Also, quite contrary to Russia, emissions growth rates are always lower than economic growth rates. Limiting anthropogenic greenhouse gases in Russia to 70-75% of 1990 levels by the year 2030 might be a long-term indicator, subject to the maximum possible account of absorbing capacity of forests. This appears as ambiguous, but could be taken as meaning a long term maximum. I have quickly done a similar analysis of methane emissions per capita as in Figure 2 for CO2 emissions. The scale this time is in kilos, not tonnes. OECD emissions had been falling but are forecast to rise. The rise is not as great as for CO2. In Russia and China emissions are forecast to rise. In Russia this is by a greater amount than for CO2, in China by a lesser amount. In Africa, per capita emissions are forecast to fall slightly. Between 2010, CH4 emissions are forecast to rise 3.1 times and population by 4.3 times. In both the USA and Other OECD (a composite of CI’s categories) total CH4 emissions are forecast in 2100 to be 2.778 times higher than in 2010. In both China and India total CH4 emissions are forecast in 2100 to be 2.420 times higher than in 2010. Correct me if I’m wrong, but there has not been a single scientific, peer-reviewed study conducted by anyone that states a 2, 3, 4 or 5 degree increase in global temps will be of harm and/or dangerous. AFAIK, the 2 degree ‘meme’ originated from a 1975 ‘discussion paper’ by W.D. Nordhaus, an economist. You may be right about the two degrees being pulled out of the air. But this post does not question the policy aspiration, which requires (along with the usual heroic assumptions) that emissions need to be lower in 2030 than today and be falling rapidly to near zero before the end of the century. It shows that the claim from Climate Interactive that emissions if policy proposals are enacted will be about 40% lower in 2100 than without mitigation policy are bogus. Policy proposals are much smaller than that.